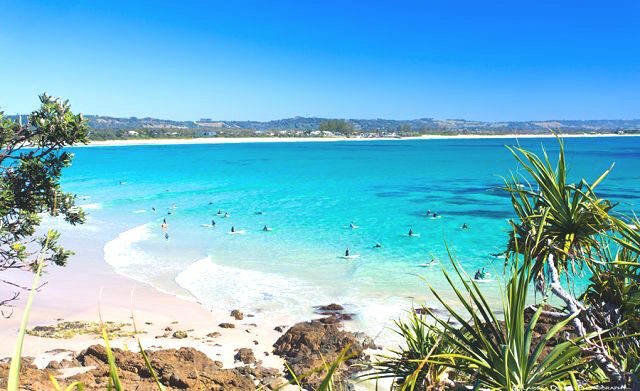 The best summer activities in Byron Bay for when you’re sick of laying on the beach. Did you really go to Byron if you didn’t experience a sunset picnic? With stunning beaches and grassy coastal cliffs, the Byron region is perfect for a sundowner, particularly with the late summer sunsets. If you like the hard work done for you, organise a platter from Cape Byron Platters. Otherwise, head to the shops and stock up on antipasti goodies, grab your picnic blanket, a bottle of wine and get comfy for the afternoon. Where are the best spots for your sunset picnic? Main Beach: Perfect if you want a lively atmosphere with music and fire twirling. Broken Head: For somewhere quiet, walk along the two sisters track until you come across the large grassy headland. You can watch the sunset from on top of the world – it can get windy here, so pick your day wisely. Cosy Corner – Calm and secluded, cosy corner is a stunning protected beach for your sunset festivities. The hinterlands surrounding Byron Bay are full of hidden wonders. If you want a day away from the beach then head to Minyon Falls. The 13 km walking track is hidden under the rainforest canopy, providing you with a refreshing escape from the heat. Pack a picnic lunch and enjoy a dip in the cool, fresh water pools before you head back home. Byron Bay is full of spiritual retreats, yoga studios and massage parlours. It is THE place to stop and reset. Start your morning the right way with an invigorating sunset yoga session. If you’re an experienced yogi simply grab a mat and head down to the beach. Otherwise, there are plenty of studios and groups offering a range of yoga classes for beginners and experts alike. Surf culture in Australia is strong, our coastlines attract surfers from all over the world and it’s easy to see why. This intense love for surfing, can often be intimidating for travellers and beginners surfers trying their hand for the first time. Luckily in Byron, we have a little slice of heaven called The Pass – the perfect spot for beginner riders. During low tide, the pass is home to slow rolling waves which stretch along the entire coastline, leaving plenty of room for everyone. Grab your longboard and spend the day here mastering your skill, surround by relaxed, easy going surfers who won’t judge your lack of talent. Just across the road from Main Beach, the Beach Hotel is a hotspot for locals and visitors alike. Grab yourself a pint and settle into the courtyard for a breezy afternoon of live music. The skies light up as the sun sets and before you know it you’re celebrating under the stars. This venue is the perfect way to end a long summers day, with its cruisey atmosphere and varied bands rocking out late into the night. Need a break from the sun? Spend the day tasting boutique beers, wines and spirits at one of our many breweries and distilleries. Stretching from Tweed Heads down to Lennox Head, the east coast is dotted with boutique venues like Stone & Wood Brewery and Husk Distillery to name a few.